When does someone have a personal injury case to pursue? I was seriously injured in a motorcycle crash and the driver was uninsured. What should I do? 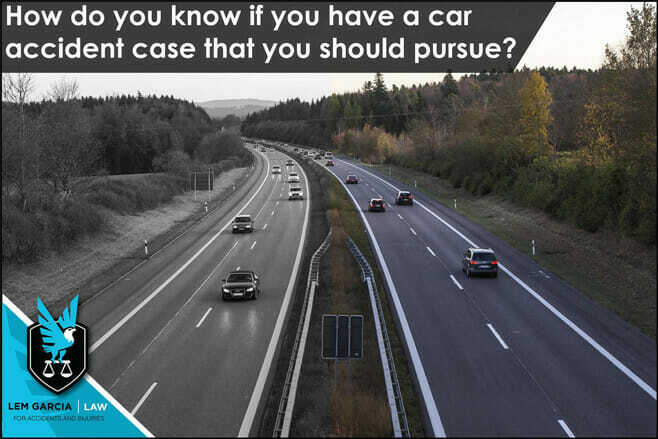 How do you know if you have a car accident case that you should pursue? Not everyone who is involved in a car accident has a case that they should pursue. Generally speaking, if you were 100% at fault for an accident, you do not have a case to pursue against the other party. If you were not injured or not damaged in any way, you do not have a case to pursue. If the other party does not have insurance coverage or any assets worth pursuing, then you most likely do not have a case worth pursuing. The question of whether you should pursue your car accident case ultimately comes down to three main issues: liability, damages, and insurance coverage. Even if you were partly at fault or even mostly at fault, you still have a case to pursue. Your claim for damages would just be reduced by your percentage of fault. For example, if your damages are $100,000 and you were 25% at fault for the crash, your claim would be worth $75,000. The less you are at fault for your accident, the better it is for you and the more likely you should pursue your case. For car accidents, damages include property damage and bodily injury. Property damage claims the amount of time your loss the use of your vehicle, your rental charges, and how much it costs to repair your vehicle. If your vehicle cannot be repaired, or if it is cheaper to pay you for the value of your car, you will get paid the value of your car in today’s market. Your bodily injury claim includes medical bills, pain and suffering, and lost wages. The more medical records and documentation you have to record your injury, the better it is for your case. Make sure to get medical treatment if you are not feeling well. The more damages you have, the more likely you should pursue your case. Lastly, insurance coverage is another serious issue. No matter how injured you are, you may not be able to recover anything in the end if the other person does not have any insurance coverage nor any assets. If you have uninsured motorist coverage under your own policy, however, you will still be able to recover for your bodily injury claim. What is important to consider is how much insurance coverage the other person has and how much uninsured motorist coverage and medical payments coverage you have. The more insurance coverage there is, the better it is for your case. Ultimately, determining whether you have a car accident case worth pursuing should be discussed with an experienced personal injury attorney. It would not be wise of you to trust that the insurance company is ready to step up and pay you fairly for your case. The insurance company will try to settle your case with you prematurely for much less than what your case is worth or may even tell you that it is not worth getting an attorney to represent you because you will have to pay your attorney. Yes, it is true that you will have to pay your attorney from the recovery in the case, but it is usually very much worth it. If you were recently injured in a car accident, call Lem Garcia Law, car accident attorney in West Covina. Lem Garcia Law provides free, no-obligation case strategy sessions to people who need help after an accident.